Karun 4 power plant includes four units of 250 MW with the annual power production of 2,107 GWH. The plant is located in Iran's Southwestern Chaharmahal and Bakhtiari province, 180 kilometers Southwest of the provincial capital city of Shahr-e-Kord. To review photos of the construction of the dam on Karun, please click here. Iran has done a good job in harnessing its hydro power assets with construction of many dams. Iran has also launched the construction of world's largest concrete dam in country's Lorestan province. All of Iran's dams and infrastructure was built with solely domestic engineering skills without any engineers and advisers that the shah's foreign controlled puppet regime used before the great revolution. Iran was constructing 88 small and giant dams in 2007. On average, close to two billion cubic meters of water are added to the country’s water reserves annually. As of 2010, Iran has constructed 588 dams (big and small), with 137 more under construction and 546 planned. 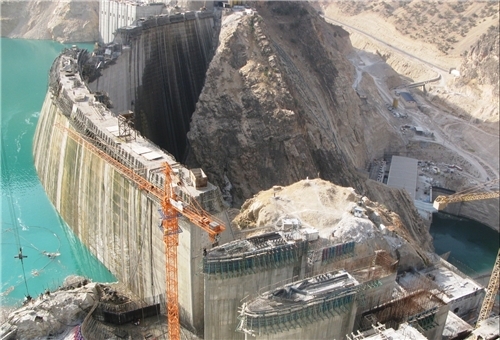 In the post-revolution era, Iran's dam building capacity was significantly strengthened, with some 200 contracting companies, 70 consultant firms and 30 corporations as well as hundreds of hydroelectric manufacturing units having been established inside of Iran in less than three decades since the revolution.